The lock was built by volunteers from Gloucester Gaol, and Stratford’s Shawshank offered a tough kind of redemption. 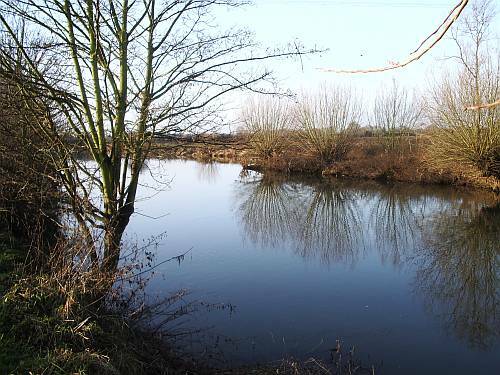 The shifting silt provided tricky ground for digging through the river bank, and the working party endured long hard months before their task was complete. 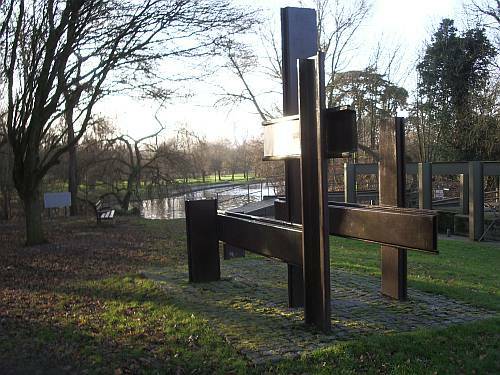 A simple monument of stacked girders stands by the lock today to mark the prisoners’ great achievement. And curst be he y moves my bones. Millions have come to look, but in four centuries no one has moved him yet. The sky is reflected blue and deep today, the cloudy waters of another working year now flowing clearer through my mind. A reach of quiet river bank brings me to another lock, then I cut left up onto the wooded undercliff, and up and down between the trees before emerging to greet the sunlight. 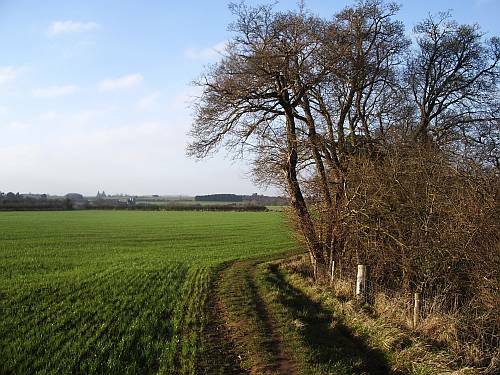 The view across open fields of Cross o’the Hill Farm towards the Cotswold Hills looks fresh and green on this bright midwinter morning, the winter wheat pushing up hopefully through the red Warwickshire soil which tells of the Triassic Keuper Marl beneath. I trot another field or three to find the riverbank again. In front of me stands the abandoned railway crossing which now carries The Greenway across the Avon. 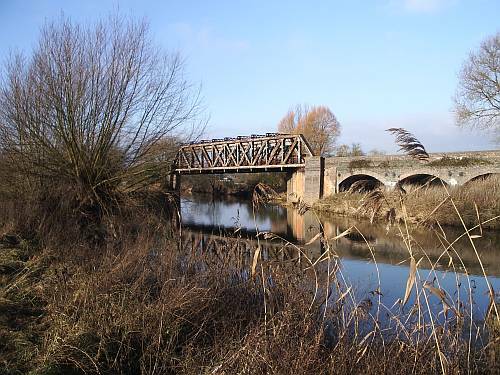 The old cantilever bridge stands strong and solid, and until 1976 it still took trains heading south to Cheltenham. Now it’s a walking and cycling path. I follow towards the town. 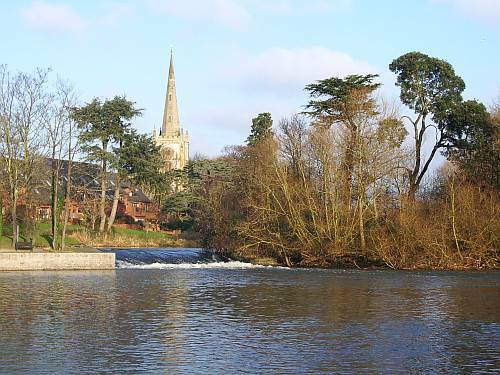 Holy Trinity’s steeple, the Dirty Duck pub and the Royal Shakespeare Theatre all stand ahead, but before I reach them I loop right to cross the river at Lucy’s Mill. Here, just below the weir and many years ago, I found my first fossil – a common Jurassic oyster named Gryphaea, reworked from limestone hills around the town and washed within Ice Age gravels which floor the river valley. I run beside the water and think about this place. 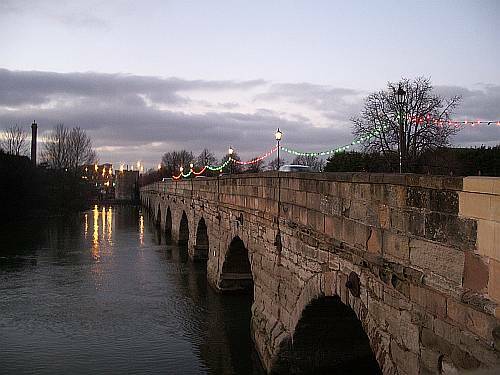 Stratford-upon-Avon – it’s just a small market town, nestling in a fold of ground where the Roman road once crossed the river. But Shakespeare called it home. And so did I.
I found my oyster here, then left to find the world. 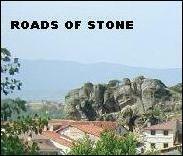 This entry was posted in 2009, geology, heroes, history, life and times, poetry, Shakespeare Country, winter. Bookmark the permalink. What a lovely place to take a run and clear your mind! The landscape is breathtaking. Thank you, Skye. It’s great to run beside the water, and this five mile outing is one of my favourite routes anywhere. It’s familiar territory for me, and I love the combination of famous picture postcard views across the river, followed by the break-out into open countryside beyond. And better still — it’s flat…! Roads, my eloquent friend, you should consider writing a guidebook. Thank you, Jonas — I might just do that. As a student returning back to Stratford for the holidays, one of my favourite vacation jobs was selling guidebooks to tourists visiting Shakespeare’s Birthplace. It was great fun, answering unlikely questions. ‘How much does a taxi cost to London?’ — hard to say, but at 100 miles it’s probably astronomical and I prefer to use the train. ‘Where can I buy some Elizabethan food in this town?’ Again, not all that recommended since 400 years is well past most conventional eat-by dates. ‘Is this a theatre?’ No, it’s a house. Honest. 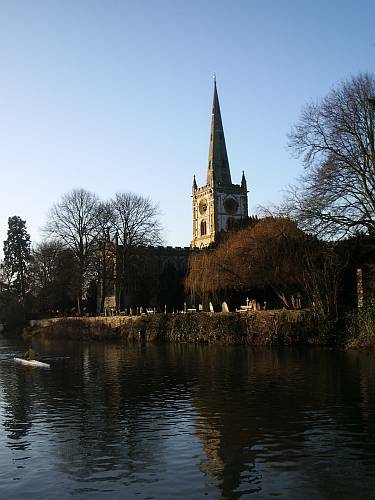 It´s great to revisit Stratford upon Avon through your beautiful lines, R.
I agree you should write a guidebook. Even armchair travelers would love it. Muchas gracias, Antonio. It’s good to hear from you, and I hope to see you soon. Saludos a Almería, desde un temporal in Inglaterra. Greetings to you from a stormy English winter’s day. Thank you, Ella. I was very excited when I found that oyster, but in fact it’s a very common one indeed. Fossils of this kind are popularly known as ‘devil’s toenails’ on account of their (slightly grotesquely) curving shape. It would be wonderful to see you soon, R.
Thanks, Ted. 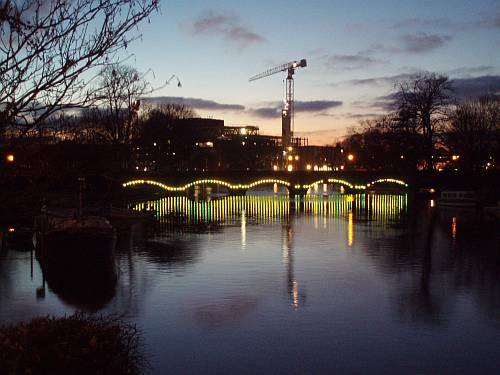 Please give my best regards to my old home town of Stratford-upon-Avon, and please make sure you look after it whilst I’m away. I just found your fascinating blog! Being an old stratfordian and an old girl of Shottery Manor, I was fascinated! Do you remember Marie Corelli old angel tombstone with a devil on its back? That was what I was looking for when I found your post and I’m so glad I did. I hope you are still revisiting Stratford. I do as often as I can. Thanks very much, H. Yes, I remember Marie Corelli’s history in the town, and her home on Church Street where the Croft School once was. 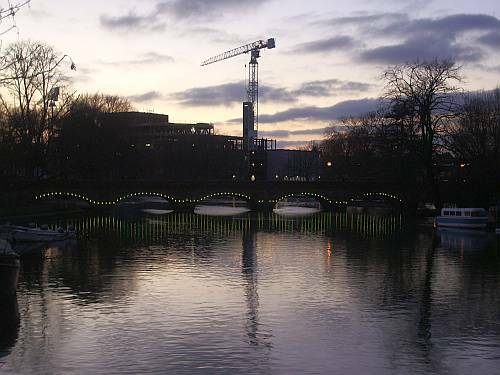 I do return regularly to Stratford and to Shottery … and I agree that it’s hard to stay away.